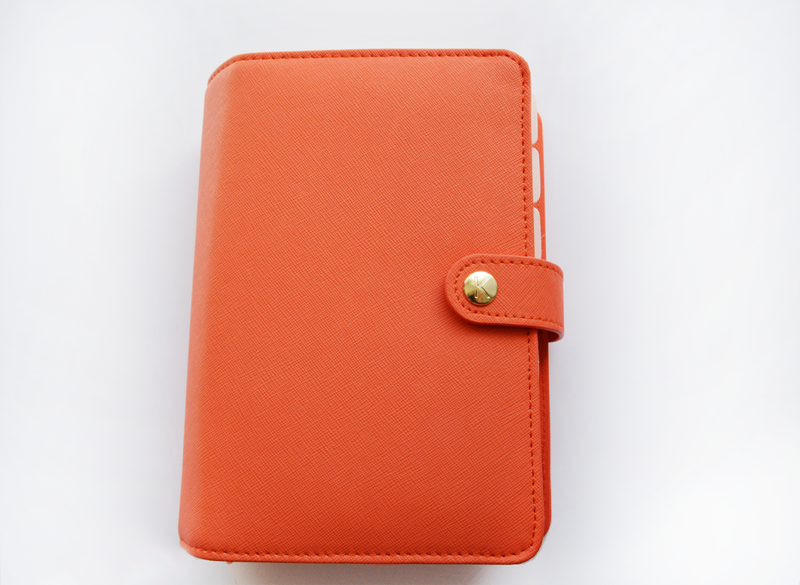 I could hardly contain my excitement when my postman knocked on my door this morning to let me know I had another package from Kikki-K. My leather agenda in Tangerine finally arrived! I was extremely excited to rip the box open and see this bad boy! When this agenda was released, there was a 20% off discount available, which was a very clear sign that I had to snag it! I also had saved a 10$ coupon another planner friend had given me, which made this one of the most inexpensive planners I have purchase by far. The colored leather on the Tangerine planner is very similar, if not identical, to the "Blush Pink" set that was released awhile back. Since I was not in favor of that particular allotment of colors, I was pleasantly surprised when the Tangerine was announced. Typically, I'm not an "orange" person, but I fell in love and could see myself using this color during the summer or whenever I need a pick-me-up! The color itself is definitely a true tangerine color. It is not bright by any means but is also not completely muted either. 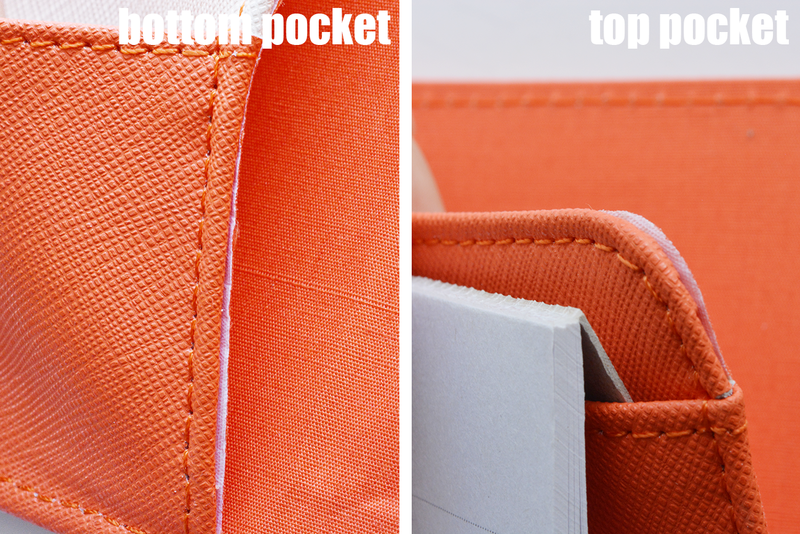 The inside features two shallow pockets as well as a deep notepad slot which combine to create a secretarial pocket. 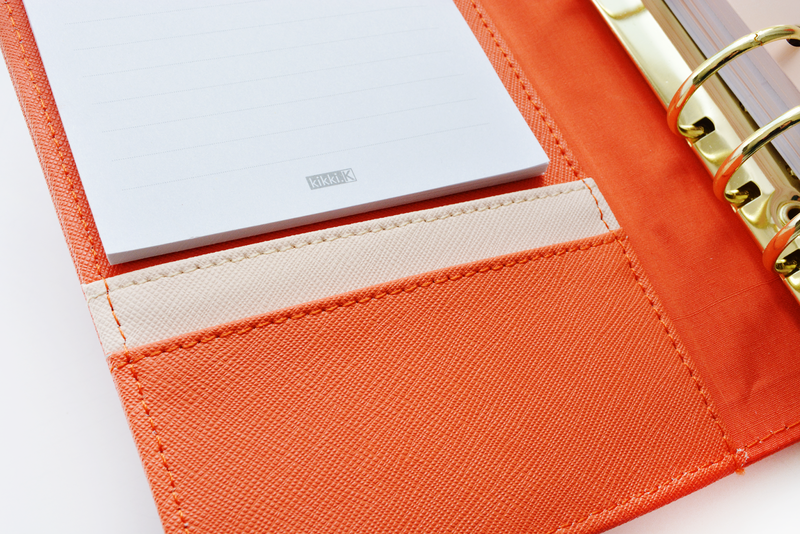 One of the shallow pockets is a light peach color which really gives this planner some contrast. The leather of the secondary pocket does not continue all the way down, as to not create any more bulk on the secretarial flap. The lining is the same tangerine color and is once again a cloth fabric. It seems as though Kikki K is partial to this newer fabric lining since it really decreases bulk when the binder itself is closed. I definitely gave the binder a deep soak in some ScotchGaurd to prevent any dirt from harming the lining. 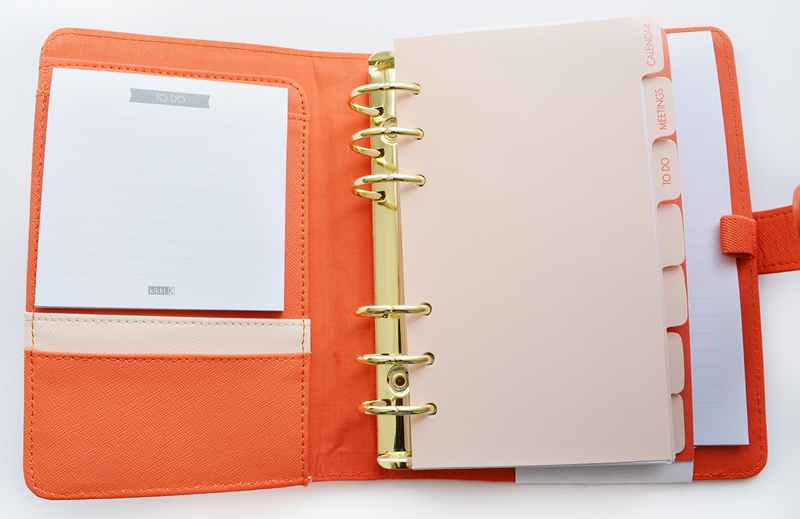 The binder agenda comes with 7 dividers with that same peach color as the pocket and includes an 18 month calendar section and quite a bit of note paper. I find that the note paper could also be used to create your own daily or weekly pages, if time or creativity is not an issue! Overall the binder is very beautiful and would recommend it to anyone who has been interested in snagging a Kikki K. Of course since each leather agenda is hand made, there maybe some quirks in the stitching or lining, as shown in the bottom picture below, but the functionality and overall look of the binder is remarkable in quality. Once again, thanks for coming by and feel free to ask me any questions. I'm very curious about the process you use to soak your binder in scotch guard. How long do you soak it for? What mixture you are using? Hi Angela! I use the Scotchgard brand Fabric Protector and coat the inner lining with a pretty thick and even coat. Since it is an aerosol can, it is really easy to control the amount! I usually repeat the process 3 times, waiting until each layer dries before applying the next. Thank you! Would you recommend it for coating a whole planner like the Kikki k cute watermelon or the cat planner? I definitely recommend it. Preferably as soon as you can! I have a few acquaintances who have used ScotchGard on their fabric Kikki's and recommend it to everyone as well!